In the wake of the 2016 election, Miriam and her husband Josh, a developer and digital marketer, felt compelled to take action. Their friend Ethan had an idea for a tool that would help people find and support progressives in their closest swing district. 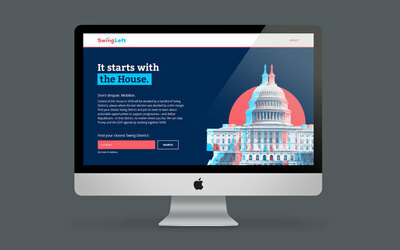 The goal was to start organizing early to flip the House of Representatives in the midterms. Josh, Ethan, and Miriam quickly got to work, calling on friends from tech, media, art, design, nonprofit, and politics to help get the tool off the ground. Miriam led the process of positioning, naming, messaging, and brand development, bringing in colleagues from Noise 13 and Heirloom to help. She focused on distilling complex ideas and political terms into simple, clear, everyday language that anyone could understand, regardless of previous political experience. 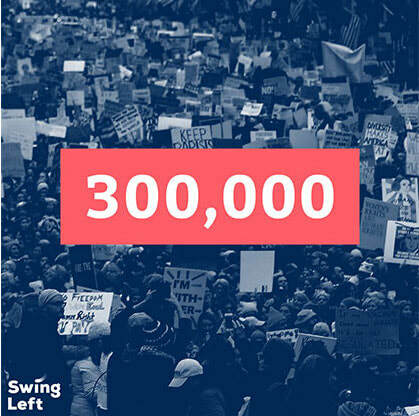 Swing Left launched in January 2018 and quickly went viral. Email sign-ups on the website exceeded 300,000 in three weeks and the organization was covered by major news outlets such as The New Yorker, BBC, PBS, The New York Times, and more. 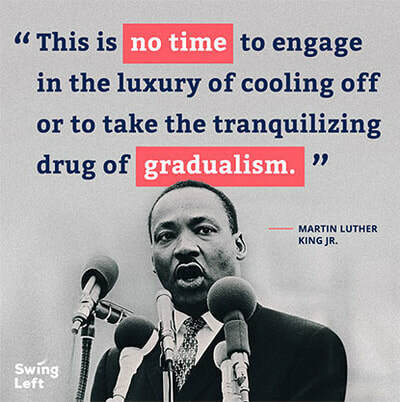 Today, Swing Left is considered one of the leading organizations in the progressive "resistance" movement. With Ethan as Executive Director and a professional team in key leadership roles, Miriam transitioned out of day-to-day operations.